_MAL1325, originally uploaded by Michael A. Lowry. 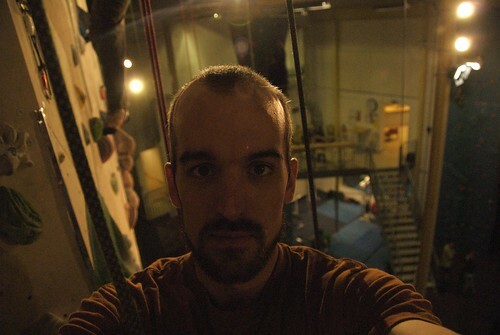 Tonight's climbing session at Klättercentret was fun a productive. Lisa and I attacked the roped routes for a while and then did an hour or so of bouldering. I managed to do several red problems and one black one. Thanks to Tjell for recommending the black one. It was fun; the heel-hook on the right starting hold was the trick for me. I carried my camera up while climbing the tall wall a couple of times, and took some photos from up there, including this self-portrait. More photos from Tuesday are also online.